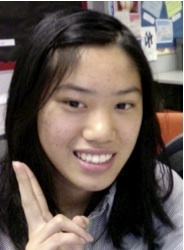 Browse: Home /	Intern Reports / Summer Intern: Lena Lai! My name is Lena Lai, and I grew up in Bushwick, Brooklyn. I have always had a habit of doing the three R’s: Reusing, Reducing, and Recycling. I encourage my family and friends to do the same. I will be attending CUNY City College and will be majoring in Environmental Earth Systems Science in the Fall and I will be pursuing graduate school in Sustainability. This year I’ve volunteered with the Gowanus Canal Conservancy and I have done trash pickup, pruned trees and mulched trees. In addition, I’ve done Earth Day activities during Earth Day Week too. So searching for an internship opportunity in my interests online, I’ve found Sustainable Flatbush, a community organization in Brooklyn and Anne Pope, the director of the organization, responded to my inquiries right away. I was impressed by the church garden restoration and solar bike projects that were going on. In addition, I was amazed by the events and the amounts of learning that always takes place as said by Anne. And hopefully I will get a lot of experience from this volunteer internship.